Welcome to The Complete Guide to Sea-Run Trout Fishing. 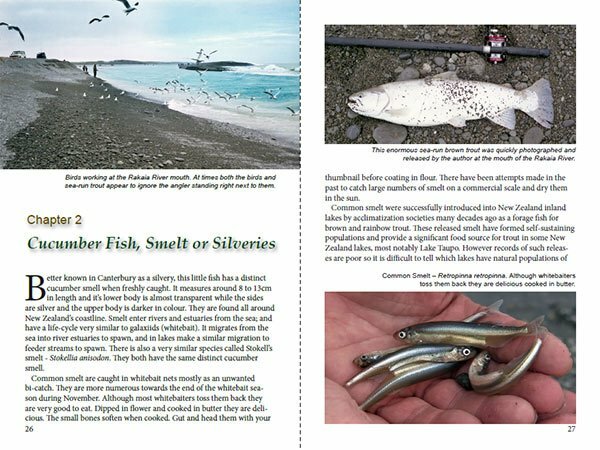 In this e-book, you will learn about sea-run brown trout, where they come from, when and where to fish for them, and we’ll also show you the tackle and fishing methods used to target these big silver coloured fish as they return to our rivers from the sea where they have been feeding. Although this book refers mostly to fishing for sea-run brown trout in my home province of Canterbury, the techniques and methods employed can be used to catch sea-run trout throughout New Zealand. Sea-run brown trout by their very nature of going to sea, and later returning to our coastal rivers, have been able to colonize almost every coastal river, stream, estuary and lagoon throughout New Zealand. Sea-run browns are particularly plentiful around the coast of the South Island. They can be surprisingly numerous in Canterbury during spring and early summer. These fish represent a significant angling resource in this part of the country where they attract considerable angler attention. In Canterbury, as in many other areas, sea-run brown trout fishing is an important time on the angler’s calendar. 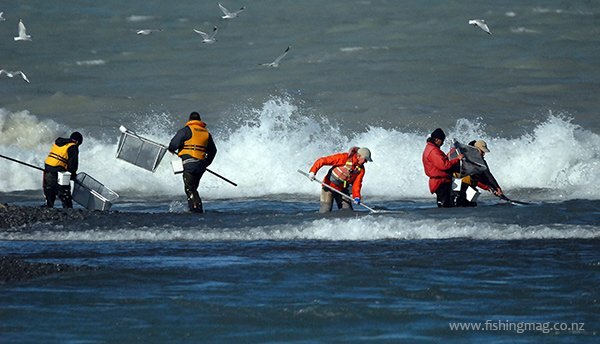 Sea-run trout fishing fits in somewhere between the whitebait season and Christmas. It is the entrée before the start of the salmon season in December. As the season progresses quite large numbers of sea-run brown trout will be entering the lower rivers from the sea. The big silver coloured browns will be feeding on the enormous numbers of seasonally abundant smelt, or silveries, which are also returning to the rivers from the sea to spawn. This book is illustrated with many unique and unpublished colour photographs. It has full instruction on how you can catch sea-run brown trout. The PDF file can easily be read by the free Adobe Reader. If you don’t have this program you can download it free from the Adobe.com website. You need at least version 9 for the ebook to play properly. My advice is to always update to the latest edition of the free Adobe Reader if you can do so. The photographs in this ebook are not only all in colour, as you would expect nowadays, they are also quite high resolution. So if you want a better look you can zoom into them using the controls in Adobe Reader. You can load this .pdf ebook on to your Andriod Smart Phone, Apple I-Phone, Tablet, Lap-Top, or Desk Top Computer. It works really well on your smartphone with high-resolution pictures, and easy to read the text. It is over 17,000 words in length so you will have plenty to read about in those quiet moments while you plan your next fishing trip. If you are new to sea-run brown trout fishing this book will set you on the right path to catching fish like one of the old-hands. Author Allan Burgess with a good sea-run brown trout. Big sea-run browns from the mouth of the Rakaia River. “The Complete Guide to Sea-Run Trout Fishing by Allan Burgess ” is available for immediate download, use the link below and you will get instant access. Yes, you get immediate access even if it’s 3:00 A.M. Please note – you are buying an ebook which enables you to gain instant access to the information without having to wait for delivery or pay shipping and handling costs – we do not ship a physical book, you can easily print the book out on your own printer at your convenience. The Complete Guide to Sea-Run Trout Fishing by Allan Burgess comes as a high-resolution pdf file with 100 colour pictures. The pdf is just over 14 MB in size. Because we’re so confident you’re going to love “The Complete Guide to Sea-Run Trout Fishing by Allan Burgess,” we offer our ironclad, 100%, you-can’t-lose money back guarantee. Order “The Complete Guide to Sea-Run Trout Fishing by Allan Burgess” right now, read it cover to cover, if you aren’t completely satisfied, then we don’t want your money. Simply contact us anytime within 30 days and we’ll refund all of your money! What could be fairer than that? P.S. Remember, the risk is entirely on me. Read “The Complete Guide to Sea-Run Trout Fishing by Allan Burgess” for 30 days and if you aren’t satisfied, for any reason, just ask for a prompt, full refund. Buy your Ebook .pdf and Download Now!